Founding Fathers Entertainment is dedicated to raising the awareness of the economic implications of redistribution, excess taxes, bailouts, and wasteful federal spending. In the game, we've included the subthemes of saved jobs because we're unsure what this really means, blame because it's easier to fault someone else, and apology because at some point we must have done something wrong. We encourage everyone to get involved. 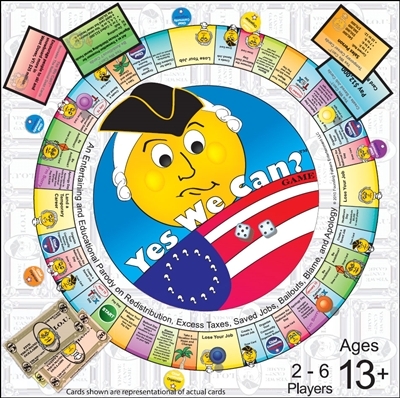 Yes We Can?TM Game was created as an entertaining way to learn and retain the details of detrimental government policies and to communicate the economic and financial foundations upon which these policies should be corrected. Through humor, more people will become engaged and direct government in a positive direction (at least that's the theory).